Intrigue and horror abound in a tale of dark cults and the corrupting power of false faith. The galaxy is vast, and worship of the God-Emperor by His faithful takes many forms. 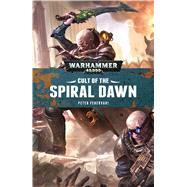 The Spiral Dawn is one of the countless sanctioned sects of the Imperial cult. When a gathering of Spiralytes makes their holy pilgrimage to the sect’s home world, Redemption, instead of the haven of enlightenment they are expecting, they find a soot-choked hellhole where their order’s founders and an unorthodox regiment of Astra Militarum maintain an uneasy coexistence. As tensions between the pilgrims and the superstitious Guardsmen mount, the new arrivals begin to unravel the dark secrets concealed at the heart of their faith... This paperback edition contains a bonus short story, 'Cast a Hungry Shadow', available in print for the first time. Peter Fehervari is the author of the novel Fire Caste, featuring the Astra Militarum and the alien Tau Empire, along with the tau-themed shorts 'Out Caste', 'A Sanctuary of Wyrms' and the novella Fire and Ice, all of which appear in the anthology The Tau Empire. He also wrote the Deathwatch tale 'The Walker in Fire', which is collected in the Deathwatch: Ignition anthology. He lives and works in London.